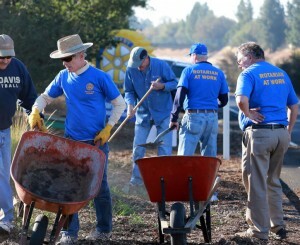 Rotarians At Work Day happens the last Saturday in April each year. Is your Club ready to join? Started in 2006 as a joint effort between two Rotary Districts (one in the United States and one in Mexico), Rotarians at Work Day continues to grow. Each year, Clubs around the world identify a hands-on project that all members can participate in to help their local community. The day is a great way to revitalize your Club, bring in new members and generate publicity for Rotary. Through the vision of Past District Governor Bob Watson from District 5340, every Rotarian in the world has the opportunity to renew our commitment to this timeless message of compassion and generosity of spirit by participating in Rotarians At Work Day. April 29, 2006, each of the 60 clubs within his District came forward and identified one or more projects that they performed. Indeed, several clubs chose two or more projects because of the diversity of their members. Many clubs partnered with other clubs including those in Mexico, and nearly all of the clubs integrated other groups to assist such as Rotaract Clubs, Interact Clubs and the Family of Rotary. Error: Error validating access token: Session has expired on Friday, 01-Mar-19 13:00:41 PST. The current time is Wednesday, 24-Apr-19 21:30:48 PDT.